Greece Soccer Team - EURO 2004 Champions - Mihalis Kapsis - by La Cancha-News On World Cup 2006 - "World's Leading Soccer Magazine!" The son of Panathinaikos FC legend Anthimos Kapsis, the powerful central defender Mihalis Kapsis appeared destined for a career as a professional footballer. Fine performances for AEK Athens FC saw Kapsis called up for the critical UEFA EURO 2004 qualifying matches against Spain and Ukraine; marking Raúl González and Andriy Shevchenko superbly in famous victories. He retained his place for the subsequent defeats of Ukraine and Armenia but missed the final win in Northern Ireland which sealed an automatic passage to Portugal. Born in 1973, Kapsis turned in a number of impressive performances for Aris Nikeas in the early 1990s as well as Anagennissi Artas before helping Ethnikos Piraeus achieve promotion to the Greek top flight in his first season at the club, 1993/94. The step up in class did not have a negative effect on the player's game, Kapsis amassing 30 appearances - his highest tally ever. 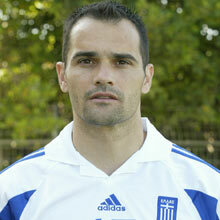 In total he scored just one goal in 123 games for Ethnikos prior to joining AEK during the 1998/99 season. 1999: He finished that campaign with 15 AEK appearances under his belt and was a regular over the next two seasons before, in 2001/02, he was fined for his involvement in a training ground row with goalkeeper Elias Atmatsidis, as AEK surrendered the championship to Olympiakos CFP in the closing weeks of the season. In 2002/03, he featured in AEK's six UEFA Champions League all draws and played 20 league games domestically. 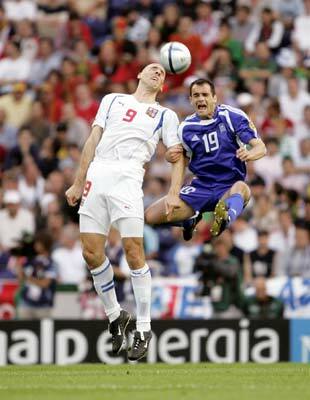 2003/04: Kapsis was his usual consistent self in what was a disappointing campaign for AEK, who finished fifth. His father played for Panathinaikos FC in the 1971 European Champion Clubs' Cup final, a 2-0 loss to AFC Ajax.